The Social Security Administration (SSA) has begun mailing informational notifications to businesses and third parties who submitted wage and tax statements (Form W-2) that contain name and Social Security number (SSN) combinations that do not match the agency’s records. Commonly known as “no-match letters,” the SSA refers to them as “Employer Correction Request Notices” or EDCOR (Educational Correspondence). The regulation behind these letters was blocked by a federal court, and rescinded in 2012, bringing them to a halt. Immigration and Customs Enforcement, however, continues to view a no-match as evidence that an employer has constructive knowledge of unauthorized employment, often including them in Form I-9 audits. The match is also important because these records can determine if someone is entitled to Social Security retirement, disability, and survivors benefits, and how much he or she can receive. If the information you report to the SSA is incorrect, your employee may not get benefits he or she is due. There are a number of reasons why reported names and SSNs may not agree with the SSA’s records, such as typographical errors, unreported name changes, and inaccurate or incomplete employer records. Beginning in spring 2019, the SSA will notify each employer with at least one W-2 form where the name and SSN do not match the agency’s records and that corrections are needed. Ask your employees to check their latest Form W-2 against their Social Security cards and to inform you of any name or SSN differences between the two. If the Form W-2 is incorrect, correct your records and prepare a Form W-2C. If the name or SSN on the card is incorrect, advise the employee to visit the nearest Social Security office to update his or her SSN record and obtain a replacement SSN card. Remind employees near the end of each year to report to Social Security any name changes due to marriage, divorce, or other reasons. Direct those who do not have SSNs or cards to www.socialsecurity.gov to obtain further information. If you file on paper, be sure to enter your employees’ names on the Forms W-2 as follows: first name, middle initial, and last name exactly as shown on their Social Security cards. The SSA encourages you to register for Business Services Online (BSO) to ensure the accuracy of wage reporting. You should not, however, use a no-match letter to take any adverse action against an employee, such as laying off, suspending, firing, or discriminating against that individual, just because his or her SSN or name does not match the SSA’s records. Any of those actions could, in fact, violate state or federal law and subject you to legal consequences. 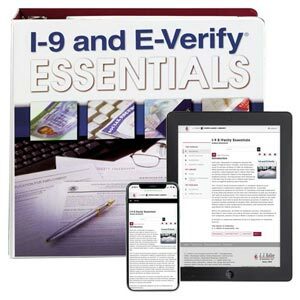 J. J. Keller's I-9 and E-Verify Essentials Manual helps you avoid I-9 errors and costly penalties related to the employment authorization process.